Before I ask anything, let me just clarify my state of mind: I have a history being a non-voluntary scapegoat in the past, to put it gently. I cannot not say I ever became used to being punished for what someone else did or said I did, whether that punishment was physical or otherwise (and there were plenty of both occurrences and results), but the semi-conscious expectation of it happening is still there. That I am extremely apologetic and don’t (or might be afraid to) complain when I do deserve something like a punishment also stem from this, but those are irrelevant here. Anyway, I am currently feeling a bit paranoid with what happened to Hopsketch(? ), and the likeliness of it happening again to other people? I know it’s not my place to ask about, but is how it sounds like a unsupported claim for a bannable offense enough to have a scroll burned accurate? Or am I just being paranoid? I would HOPE that IF there are any claims of bannable behavior, the mods would look into said claims before taking any decisive action to ensure that the claims are in fact TRUE. After all, just because a claim is made doesn't make it so as you validly point out... AND, after all, that is their responsibility. I get the SENSE that our mods take their jobs pretty seriously, and I don't THINK that they would scapegoat someone. I understand your concern of course, BUT we don't KNOW what happened in the case of Hopsketch, exactly. I don't know that the mods would ADVERTISE their reasons for their decision publicly. Given how much we DON'T know, I am not particularly worried. Of course, I am not a mod and I can't really speak definitely. Just my thoughts on it. Oh MY... This egg gives off a beautiful glow. Lemme know if you take it! Yes to Prizes in the market, no to them in the biomes, yes to more prizes distributed, iffy on the CB limit. The lowest limit I'd accept is 2 per color and breed. Also, no to getting rid of the raffle entirely. I do kind of like the "extra winner gets same color/breed as a repeat winner" idea though! Probably one of the more fair compromises. Yes, I posted my opinions here already, but I thought I'd address what came up since. I gotta say this would be MY preferred method of dealing with the issue. I can see there being.... problems with putting prizes in the biomes. I can't catch golds in the biomes so no way in the WORLD would that help me. THAT said, I DO like the idea of being able to work for one via the market ( I would be more likely to save for one of these beauties than golds or silvers, actually!) AND I'd LOVE to see more winners per month in the raffles. As for limits.... Mehbe. Not sure on that. AS I said before... too strict of limits would prevent someone from possibly getting the prize they REALLY wanted ( AS they might possibly have won a Tin, for instance when they wanted a Shimmer) and I don't want that, really. Keileon's idea of limiting us to two of each color and breed seems fair, however. AND, of course, the limits would ONLY apply to CBs... a person can have as many bred Christmas dragons, for instance, as they can reasonably collect and the same would apply here. I would only support notifying us of a final decision. The other two would be FAR to heavy on resources, I think, and would also be a real pain. I have had up to 50 comments/votes on a single description in my time. I absolutely would not want to be told about each one. I see @Fuzzbucket's point here. You're scroll wasn't burned, I get the "You can't seem to find the scroll you're looking for" on Hopsketch456 so it's not burned otherwise you'd get the "this scroll is charred and impossible to read". Did you perhaps put in the wrong password or something? @LadyLyzar or @purpledragonclaw can you see what's going on? Oh! OK! Thanks for the info, @Dalek Raptor. I wasn't aware that that gave a different message. Good to know! I would say PM TJ or perhaps the mods. ALL it says when I look is that I can't find your scroll. I am unsure what issue there might have been AND,whatever the case, I don't think your average user is privy to whatever reasons there might have been for any decision of that sort. I will add here that I THINK there isn't ALWAYS a warning before a scroll is burned, unfortunately. I may be wrong about that and If I am I hope someone will correct me. I may, once again, be late at noticing, but since when has there been a new message (and, hopefully, a new mechanism) for Pinks?? Hmmmmmm... I fully support the dot idea as I THOUGHT I posted somewhere already. ESPECIALLY if it shows up in breeding lists. I am not so sure of the idea of gen numbers. HOWEVER! I wonder if that is something that could be made an option in one's account settings? So that those that want them can have them and those that find them intrusive could turn them off? Yes. I agree. I wouldn't be OPPOSED to having the information, necessarily. I would be interested in knowing how many of a given breed I currently have, as well. NT necessary as was said, but it would be interesting to know, for example, how many reds, waters or golds exist in DC. This, too. I MUCH prefer one to the other, and would be sad if I were limited after winning the "wrong one" - not that I will EVER win ! I would be very dissapointed, actually, IF I won and ( As would probably be my luck even if I were lucky enough to actually WIN a prize!) got one that wasn't a favorite and THEN wasn't able to try again. IS it frustrating to see some people win multiple CB prizes while others ( like.... myself for example) have none at all? ABSOLUTELY. However, I don't believe that those insanely lucky individuals deserve to be PUNISHED necessarily for other people's lack of win, and I don't think this is the solution to the problem... it doesn't REALLY address the fact that we still don't have any OTHER way to work towards prizes but trying to enter the raffle every month. I'd be more in favor of alloting more winners per raffle, perhaps.... or , my fave.... adding the pretty prizes to the Market so that those of us with questionable luck can save up for them! is there a rule ( or limit ) in what can be asked for a 2G prize ?? 21 rare hatchies seems REALLY high .. or is it trader beware ??? AFAIK.... there isn't a LIMIT per se.... other than what people are willing to pay for it. As in... they CAN ask that for it.... doesn't mean they will GET it. 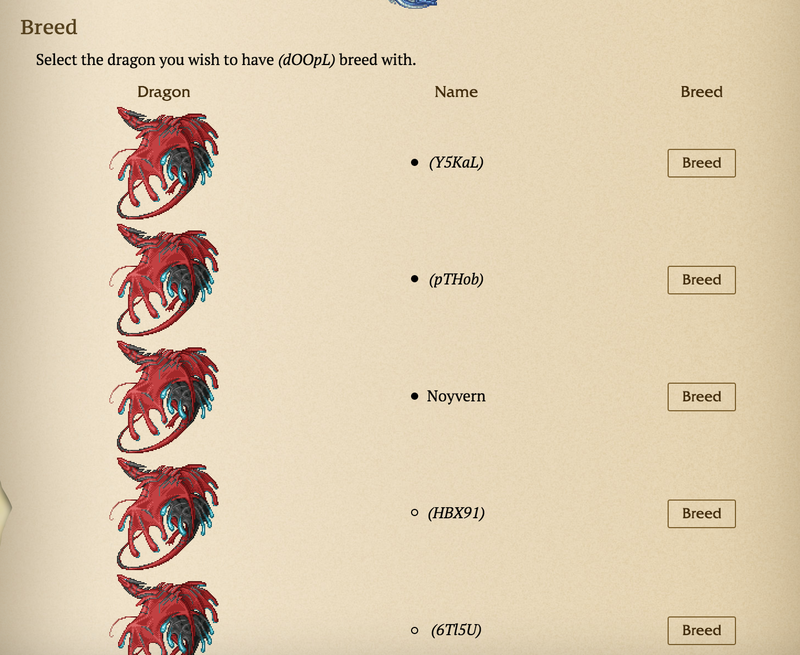 I've made a small mockup - one on your main scroll, one on the breeding page. I imagine it like a small dot before the beginning of the name. Solid is for CB, open is for bred. Not 100% sure on how it would change with the really long names but I think it's doable! Oh, YES! I actually think this is a good idea. Plus as others have said, it would give me an easy way of double checking my own grouping for mistakes , ensuring that no CBS are missed, for example. Yikes... The hostility isn't necessary. Some eggs like Witchlights have really fascinating cracking stages, so I can see why people might be interested in that. Would complicate my text idea, though. Only really checks out for a whole shell. OR the Arcanas. AND some of the whole and intact eggs we have are GORGEOUS ( Thank you, spriters!) so I can totally imagine why people would want to permanently collect them! THOUGH that being said, I don't freeze many hatchies, even, personally... though I am ALL for people having the option. IMHO the same applies to this suggestion. LIKE, probably not a thing I would use often if at all. AT said, again, that doesn't mean I am opposed to the option. After all as @PhoenixEterna and others have said.... we allow people to give their eggs to a vampire to bite ( QUITE possibly killing the egg rather than turning it) OR neglecting it ( AGAIN, quite possibly killing the egg rather than succoring in the experiment to make a neglected.) EVEN if none of those options existed there is still the possibility of the egg being raised improperly and dieing do to not hatching in time, for instance. Being a dragon egg isn't and never WILL be fully safe. Bottom line... any number of unpleasant things can happen to a pixel egg already. AND , really, freezing the egg so that it can't hatch is probably one of the tamer ones. Just because the option exists doesn't mean that I personally am required to use it. My opinion... give us the option and let us decide whether or not we want to freeze eggies, just like we decide whether or not to freeze hatchies. AS for limits... I would prefer a separate Freezing limit for eggies. Hatchies have a limit, and eggies would , too... but eggies wouldn't count towards the hatchling freezing limit and nor would hatchies count towards the eggs. SO... if someone had frozen their limit of hatchies for whatever the cooldown is, they could still freeze EGGS provided that they had NOT also met their limit for them. SO overall... I vote "Yay," to this idea, even IF I am unsure if I would use it. OMG. The Aqualis dragons are gorgeous. And the Blancblack is so sleek - yin-yang like. i KNOW.... glad I caught myself a good batch of Aqualis Eggs, but... wishing I could get a pair of Blancblacks to go with them. I agree - work the same way as freezing, if this were to happen. This is sort of how I see it, too. AS it stands right now, a person can freeze whatever hatchies they like and the person who bred them has no say. I see no good reason for this to be different. The yellow is more gold on the alts, but depending on your monitor it can be really hard to tell. Hmmm... so what I MAY need to do is raise them to stage two, then if I am unsure ( Whent he different colored flowers appear. Like as far as I can tell the differences at S1 are pretty minor.... just a difference in color, and a slight one at that? How can you tell so easily? Is there something I am missing. Hey! 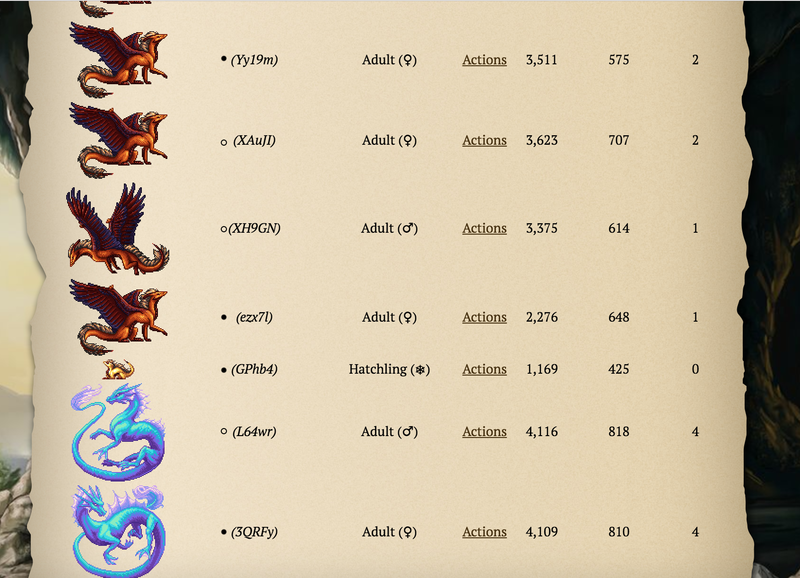 Dumb question maybe, but recently I decided to breed and hatch for alt vine dragons. TROUBLE is that I am finding it MUCH harder to tell if I have alts on vines than, say, blacks or Undines. More tools to use are always a good thing! THOUGH I might have to figure out WHAT to use them for, myself. At said, as I don't have any problem iwth adding to the groups system as it exists. Clipped for emphasis, but WOW! Your post got me to thinking. I guess I never LOOKED at it that way. Like... I always figured if I wasn't 'GOOD' at a thing ( here meaning, extremely, INSANELY good at it,) then I wasn't WORTH anything at it. A very rigid Black OR White, if Then way of looking at it? No nuance or room for a sliding scale? Take, for example, my routine struggles with feeling 'good enough in chess. Like... if I lose I don't feel I have any talent for the game at all( ALTHOUGH I enjoy it). AND at that point I even wonder if I should continue to BOTHER. This gets tiresome because the even UGLIER side of this IS that now matter how many games I DO win, I always expect more from myself and it is never 'good enough'. I suspect that even IF I were absolutely, undeniably the best , it MIGHT not FEEL good enough, even then. Like, I always seem to take my failures more to heart than my successes. It gets tiring after a while ( AND even worse when I have had a loss and and am trying to compensate)... and there is part of me that wants to just be able to ENJOY the activity FOR ITSELF without making it into 'proving myself to myself'. Perhaps the TRUTH is that I have been looking at it all wrong? MAYBE,in some ways, I have the same problem @BlueMint does? That is... constantly comparing myself to others? AND perhaps worse even,not JUST comparing myself to others but using an an absolutely unrealistic sampling to do it. ( IE...looking at grand masters and saying " I am not as good as that, therefor, I have no talent at chess?") Food for thought, anyway.